Did Hedge Funds Drop The Ball On Qorvo Inc (QRVO) ? Before we spend days researching a stock idea we’d like to take a look at how hedge funds and billionaire investors recently traded that stock. S&P 500 Index ETF (SPY) lost 13.5% in the fourth quarter. Seven out of 11 industry groups in the S&P 500 Index were down more than 20% from their 52-week highs at the trough of the stock market crash. The average return of a randomly picked stock in the index was even worse. This means you (or a monkey throwing a dart) have less than an even chance of beating the market by randomly picking a stock. On the other hand, the top 15 most popular S&P 500 stocks among hedge funds not only recouped their Q4 losses but also outperformed the index by more than 3 percentage points. In this article, we will take a look at what hedge funds think about Qorvo Inc (NASDAQ:QRVO). Hedge fund interest in Qorvo Inc (NASDAQ:QRVO) shares was flat at the end of last quarter. This is usually a negative indicator. The level and the change in hedge fund popularity aren’t the only variables you need to analyze to decipher hedge funds’ perspectives. A stock may witness a boost in popularity but it may still be less popular than similarly priced stocks. That’s why at the end of this article we will examine companies such as Allegion plc (NYSE:ALLE), The Western Union Company (NYSE:WU), and LKQ Corporation (NASDAQ:LKQ) to gather more data points. Today there are several metrics market participants employ to evaluate publicly traded companies. Two of the most useful metrics are hedge fund and insider trading signals. Our researchers have shown that, historically, those who follow the best picks of the top money managers can outpace the broader indices by a very impressive amount (see the details here). We’re going to analyze the latest hedge fund action regarding Qorvo Inc (NASDAQ:QRVO). How are hedge funds trading Qorvo Inc (NASDAQ:QRVO)? At the end of the fourth quarter, a total of 28 of the hedge funds tracked by Insider Monkey were bullish on this stock, a change of 0% from the previous quarter. 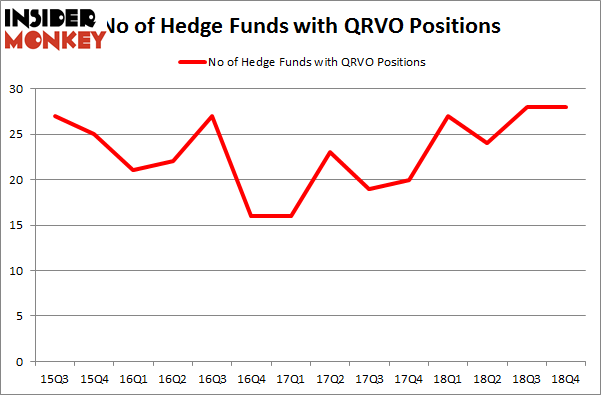 By comparison, 27 hedge funds held shares or bullish call options in QRVO a year ago. With hedge funds’ sentiment swirling, there exists an “upper tier” of notable hedge fund managers who were boosting their holdings considerably (or already accumulated large positions). The largest stake in Qorvo Inc (NASDAQ:QRVO) was held by Baupost Group, which reported holding $648.7 million worth of stock at the end of September. It was followed by Iridian Asset Management with a $173 million position. Other investors bullish on the company included Soroban Capital Partners, Scopia Capital, and Fisher Asset Management. 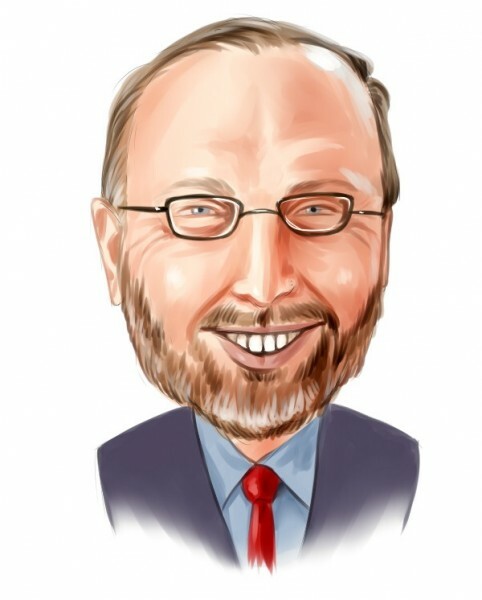 Seeing as Qorvo Inc (NASDAQ:QRVO) has faced falling interest from the aggregate hedge fund industry, it’s safe to say that there lies a certain “tier” of hedgies that slashed their positions entirely in the third quarter. It’s worth mentioning that John Hurley’s Cavalry Asset Management dropped the largest investment of all the hedgies followed by Insider Monkey, comprising close to $43.2 million in stock, and Charles Clough’s Clough Capital Partners was right behind this move, as the fund sold off about $6.9 million worth. These transactions are important to note, as aggregate hedge fund interest stayed the same (this is a bearish signal in our experience). Let’s go over hedge fund activity in other stocks – not necessarily in the same industry as Qorvo Inc (NASDAQ:QRVO) but similarly valued. These stocks are Allegion plc (NYSE:ALLE), The Western Union Company (NYSE:WU), LKQ Corporation (NASDAQ:LKQ), and Bunge Limited (NYSE:BG). This group of stocks’ market caps resemble QRVO’s market cap. As you can see these stocks had an average of 32.25 hedge funds with bullish positions and the average amount invested in these stocks was $672 million. That figure was $1276 million in QRVO’s case. LKQ Corporation (NASDAQ:LKQ) is the most popular stock in this table. On the other hand Allegion plc (NYSE:ALLE) is the least popular one with only 25 bullish hedge fund positions. Qorvo Inc (NASDAQ:QRVO) is not the least popular stock in this group but hedge fund interest is still below average. This is a slightly negative signal and we’d rather spend our time researching stocks that hedge funds are piling on. Our calculations showed that top 15 most popular stocks among hedge funds returned 21.3% through April 8th and outperformed the S&P 500 ETF (SPY) by more than 5 percentage points. Hedge funds were also right about betting on QRVO as the stock returned 23.9% and outperformed the market as well. You can see the entire list of these shrewd hedge funds here.